Position:full sun or partial shade Soil: well-drained, moderately fertile, neutral to slightly acid soil Rate of growth: average Flowering period: May and June Flower colour: rich-purple Hardiness: fully hardy Gorgeous, rich purple flowers with tiny yellow throats in May and June and slender, strap-shaped leaves. 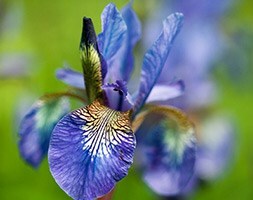 This striking Siberian iris is versatile and low-maintenance. Perfect for providing vertical interest in a sunny, well-drained herbaceous border or waterside planting, for maximum impact plant in bold clumps, allowing plenty of room. Garden care: Plant shallowly with the upper part of the rhizome sitting on the surface of the soil, incorporating a low nitrogen fertiliser in the planting hole. After planting remove the upper-most third of the leaves to minimise the incidence of wind-rock. In exposed areas stake with bamboo canes in early spring.